We are doing a poker run in Woodstock Ontario on the 16th of July 2011 to benefit the Ontario Heart and Stroke Foundation. Registration will start at 8:00am at C&D lanes at the corner of Main St. and Mill St. in Woodstock Ontario. The ride will be aproximately 180-200k with a stop around Oxford County and finishing at the Moose Lodge. There will also be a BBQ at one of the stops as a lunch break. A 50/50 draw and door prizes at the Moose Lodge along with a prize for the most pledges. Cost of the ride is $15.00 for bike and rider $20.00 bike rider and passenger. If you bring $100.00 in pledges you ride for free. Pledge Forms are also available at JohnsJourney and any other questions feel free to contact me at johnsjourney@hotmail.ca or on our Facebook group Johns Journey ride for heart and stroke. 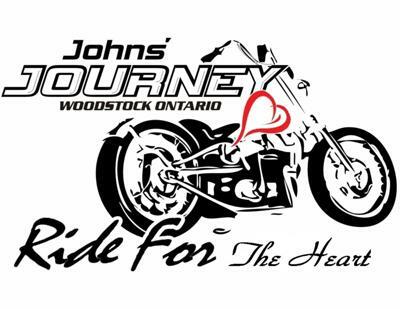 John's Journey is a charitable motorcycle ride event that takes place in the Woodstock area every year. Take pledges to ride using your pledge form and ride to support donations to Heart and Stroke Foundation of Ontario. This ride was founded by Fred Deadman in Memory of a dear family member, John Harris. John was an avid rider and enjoyed life with his family and friends and a passion for riding. John passed away from a heart attack and will be dearly remembered by all who knew him.